This time of year definitely calls for fresh pasta or gnocchi to be made, preferably once a week in my book! 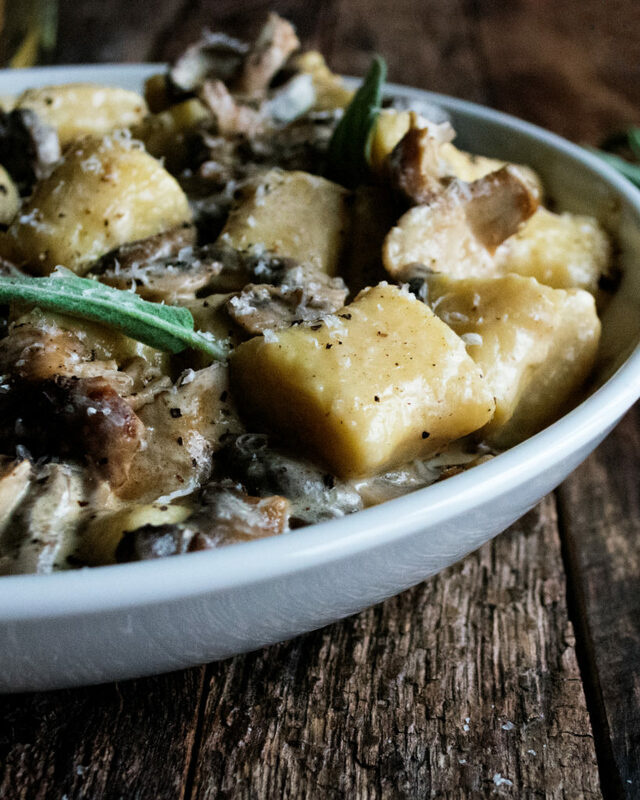 This Creamy Mushroom Gnocchi with Parmesan & Sage is going to be my recipe of choice for the next couple of weeks…and probably all the way through next spring! I hope it becomes yours, too. It is SO good. Does anyone else always crave pasta or gnocchi this time of year? Last year my favorite cozy recipe was this mac & cheese, and now this year it’s this gnocchi. 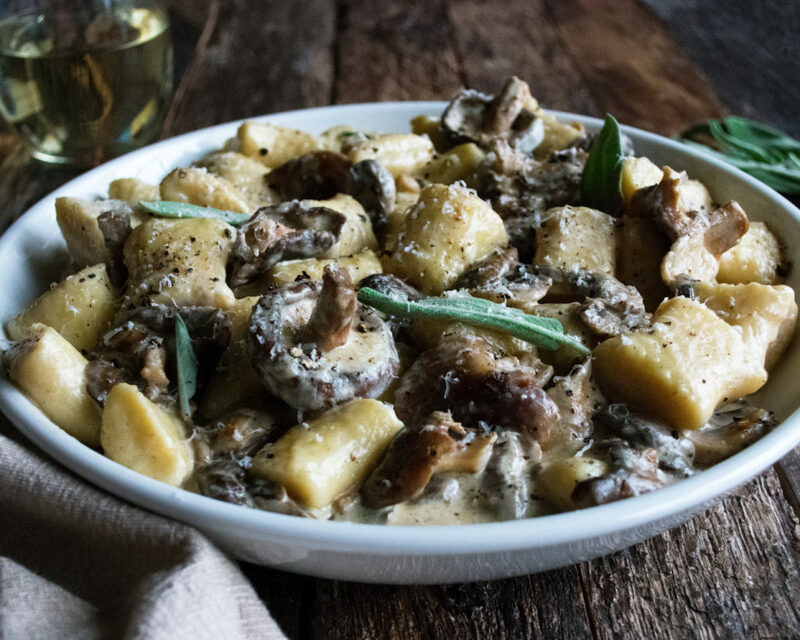 You’ll notice the ingredient list for this creamy mushroom gnocchi recipe is fairly short. 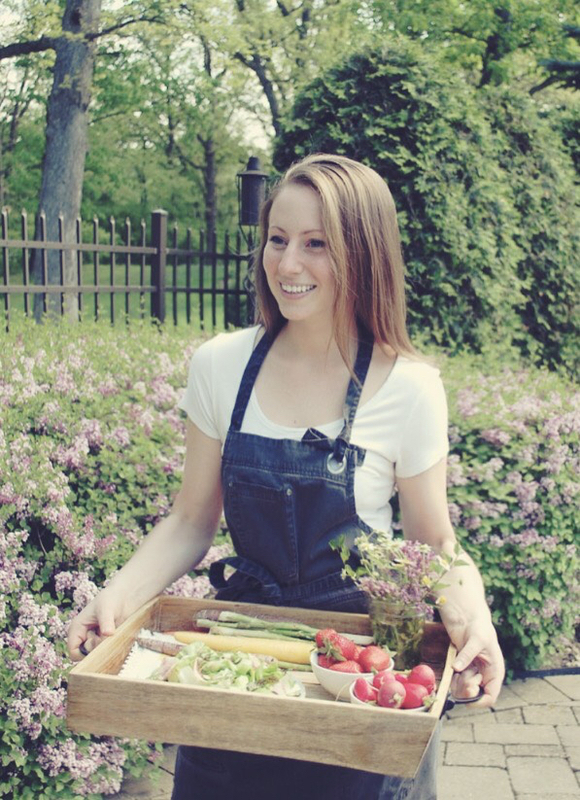 It’s all about taking minimal, simple ingredients and handling them with care. 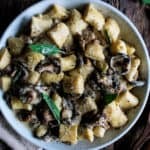 The result will be soft, pillowy gnocchi with the most luxurious creamy mushroom sauce, full of parmesan cheese, freshly cracked black pepper, and sage. Here are the basic steps to making this gnocchi. It’s fairly straightforward. The biggest key is to not overwork the dough. There is no kneading involved like most other pasta doughs. 1. Bake russet potatoes until tender. 2. Let cool, peel, and pass through a food mill. 3. Combine with egg yolks, salt, flour, and parmesan cheese. 4. Mix just until the dough comes together. 5. Shape into a ball, roll into ropes, cut into gnocchi. 6. Let gnocchi dry while a pot of water comes to a boil. 7. Boil for a few minutes, toss in sauce, and EAT. I explain the process in a bit more detail below in the recipe, but I just wanted to show you that it really isn’t that difficult of a process. It does take some time, though, so I’d save this one for a lazy fall weekend night. 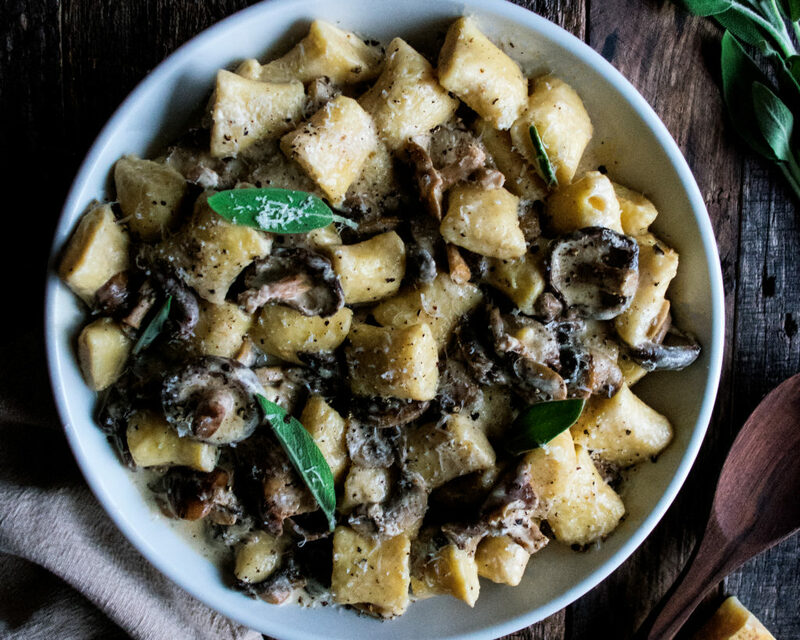 Get comfy, light some candles, put on some music to set the mood (The Lumineers pandora station will ALWAYS be my fall cooking music of choice), and enjoy the process of making a ridiculously good bowl of creamy mushroom gnocchi at home. Oh, I also forgot to mention… the sauce is just a few simple steps. It comes together really quickly. The only thing I’d watch is how long you reduce the cream. You need to reduce it enough to thicken, but not so far where it breaks. Keeping the heat at medium will help control this process. Everyone’s stove, pan, etc. is different, so this really has to be done by sight and instinct to create a silky smooth consistency. You got this. Let me know how it turns out! 1. Preheat the oven to 350F. Use a fork to prick each potato multiple times on every side. Place the potatoes on a sheet pan. Bake for 1 hour and 15 minutes until tender. 2. Remove the potatoes from the oven and let cool. Peel the skins off the potatoes. Use a food mill to process the potatoes into a bowl. You want to be left with 1 ½ pounds of milled potato. 3. Make a “well” in the center of the potatoes. Add the egg yolks and a generous pinch of salt. Use a fork to whisk the yolks and simultaneously pull the potatoes into the center. Continue to mix until well combined. 4. Add the flour and parmesan cheese. Use a wooden spoon to incorporate them into the potato mixture. Do not overmix. A dough will form. Use your hands to press the dough into a ball. 5. Cut the dough ball into 4 pieces. Roll each piece out into a rope. Use a knife to cut the rope into small, bite-size pieces (about 1” thick). Place the gnocchi on a floured plate or sheet pan. Let dry for 10 minutes. 6. Meanwhile, bring a large pot of water to a boil. Add a generous spoonful of salt. Working in batches, cook the gnocchi in the water for about 3 minutes, or until they float to the top (do not overcrowd the pot). 7. Use a slotted spoon or strainer to drain the gnocchi and transfer them to a plate. 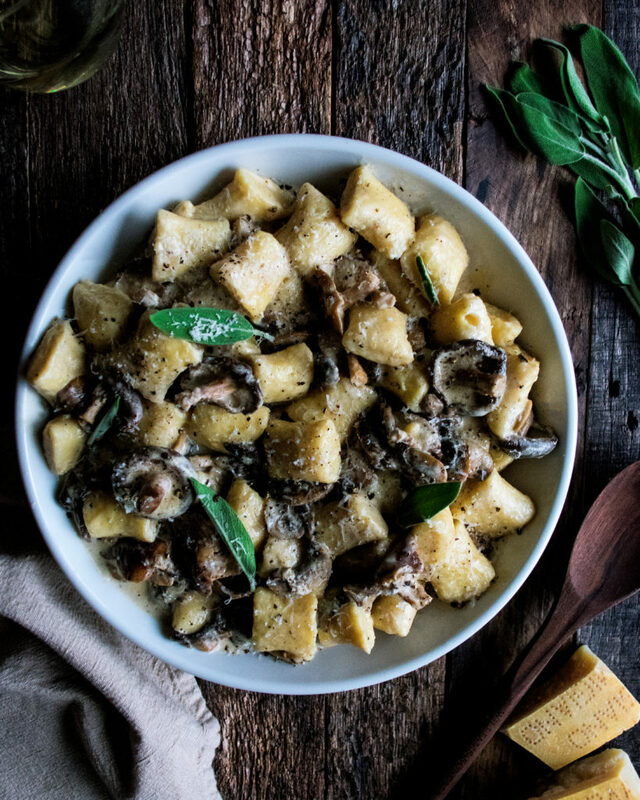 Continue to cook all of the gnocchi while you make the mushroom sauce. 1. Heat a large sauté pan over medium heat. Add the butter and let melt. 2. Add the mushrooms to the pan. Let sauté until browned and tender. Season with a pinch of salt. 3. Add the heavy cream and fresh sage. Let the cream come to a bubble. Simmer the cream for just a minute or two until slightly reduced. Stir in the parmesan cheese and a few generous cracks of black pepper. 4. Let the sauce cook for another minute or so. Add the gnocchi, along with any of the water that pooled onto the plate, into the pan. 5. Gently stir and coat the gnocchi with the sauce. Cook until the sauce has thickened and sticks to the gnocchi. Turn off the heat. 6. Season with more salt or black pepper to taste if needed. Remove the sage sprigs and serve immediately.